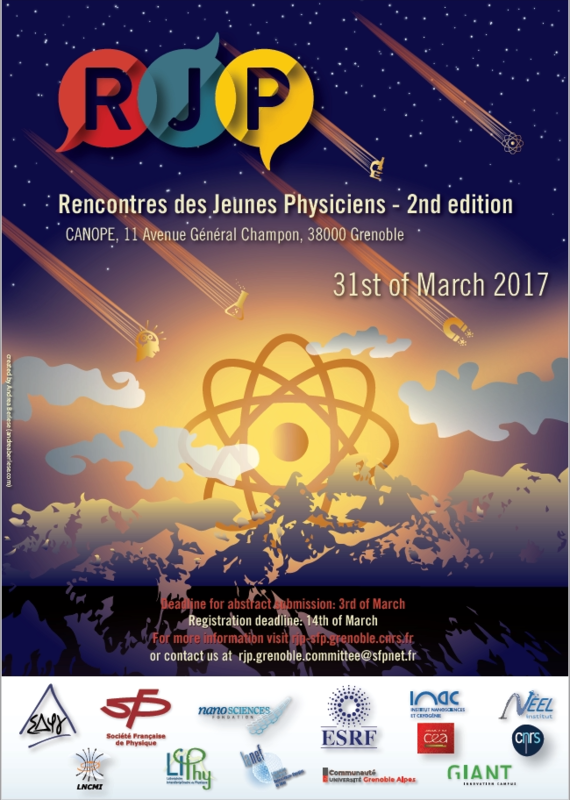 It is our pleasure to invite you to the second edition of the Rencontres des Jeunes Physiciens « Édition grenobloise ». The RJP is a one day conference for young, non-permanent scientists working in diverse fields of physics at different institutions in Grenoble. The event is promoted by the Société Française de Physique and the École Doctoral de Physique. How much? Attendance is free of charge for all of you. Just sign up online, CLICK HERE! The RJP brings together young physicists for a day of social and scientific exchange. The main focuses of the event are Interdisciplinarity, Networking and Pedagogy! Interdisciplinarity – As you might know, Grenoble is a major pole of research within France and beyond its borders. The event will give you the opportunity to gain a comprehensive understanding of the cutting edge research that is currently performed by your fellow PhD and Post-doctoral colleagues in and around Grenoble. Networking – One of our major goals is to create a strong network of young physicists working here in Grenoble. We hope the RJP will create a relaxed environment for you to exchange with others in a professional manner. And who knows, this event might lay the foundation for your future collaborations once you have moved to another national or international institution. Pedagogy – We want to give to all of you the opportunity to present your work if you want to do so. This might happen in front of a poster or in form of an oral presentation. Independently of how you are going to present, keep in mind that the audience is composed of PhD and Post-doctoral students. That means that there is no need to feel intimidated by the expertise of permanent researchers. So the RJP is a great chance for you to train your scientific communication in a relaxed environment. Scientific program: - The RJP committee is glad to announce that Prof. Dr. Wolfgang Wernsdorfer was so kind to accept our offer to give a one hour keynote talk. Prof. Dr. Wernsdorfer is a specialist in experimental solid state physics working at the interface of chemistry and material sciences. He is one of the world’s leading experts on nanomagnets and their use in quantum spintronics. But for all of you who are not that familiar with this particular field of physics – do not panic! Prof. Dr. Wernsdorfer will give a very pedagogical, easy-to-follow keynote talk on the topic “The world of nanomagnets: from the control of quantum states to quantum technologies” elaborating also some philosophical aspects of quantum physics as well as his personal experiences of how to become a renowned researcher. Anyhow, the rest of the scientific program will consist solely of oral presentations given by you – PhD and Post-doctoral trainees. Furthermore, you have the opportunity to discuss in front of posters throughout the whole. What else: - The RJP committee will organize a scientifically valuable but also fun day for you. The conference will cover diverse research fields of physics that are currently under investigation here in Grenoble. But we are also aiming at creating a relaxed environment for all of our participants. Refreshments and meals will be provided throughout the whole day. And we hope that after a long day of science you would like to socialize with all of us during apéro. Also, if you decide to present your work, do it well, and you might win one of our prices.